Address at the Catholic Life Congress in Philadelphia on Nov. 17. My comments today will be simple. I want to focus on just three points. The first point is where we are as a Church and as individual Catholics, given the current environment of our country. The second point is what we need to do about it. And the third point is who we need to be, or become, to live the kind of witness God wants from us. Before we get to that, though, I want to offer a few preliminary thoughts. Language matters. It both expresses and shapes our thinking. Vulgar language suggests a vulgar soul. Obviously, lots of exceptions exist. A peasant can have a rough vocabulary and still lead a saintly life. And a political leader can have a golden tongue and still be a complete liar. But, in general, words are revealing. They have power because they have meaning. So we should take care to understand and use them properly. The words of the Nicene Creed are the defining statement of Christian identity. They’re the glue of the Catholic community. Jews are Jews by virtue of being born of a Jewish mother. But being a Christian has nothing to do with blood or tribe or ethnicity or national origin. Christian identity comes from the sacraments, sacred Scripture and the Creed. What we believe and profess together to be true as Catholics is the foundation and the cement of our unity. Every word in the Creed was prayed over, argued over and clarified by decades of struggle in the early Church. The words are precious and uncompromising. They direct us toward God and set us apart from the world. When people sometimes claim that Islam and Christianity have so much in common, they need to read, or reread, the Creed. Catholics pray the Creed every Sunday at Mass as the framework and fundamental profession of our faith. Devout Muslims reject nearly every line of it. Over a lifetime, a Catholic will recite the Nicene Creed or the Apostles’ Creed thousands of times. But if we’re honest, we need to admit that we often mumble the words without even thinking. That has consequences. The less we understand the words of the Creed and revere the meaning behind them, the farther away we drift from our Catholic identity and the more confused we become about who we really are as Christians. We need to give our hearts to what we hear and what we say in our public worship. Otherwise, little by little, we become dishonest. Here’s my purpose in saying all this. The theme we’re here to talk about today is “Renewing the Church and Her Mission in a Year of Faith.” Four of those words warrant some attention: renewing, Church, mission and faith. Let’s start with that first word: renewing. Over time even the strongest marriage can wear down with hardship or fatigue. Couples renew their vows to remember and reinforce their love for each other. The story of the Church is much the same. History has shown again and again that, over time, the life of the Church can become routine; then an afterthought; and then stagnant and cynical, or worse. God sends us saints like Bernard of Clairvaux, Francis of Assisi, Teresa of Avila and Catherine of Siena to change that: to scrub the heart of the Church clean; in other words, to make her young again. They rekindle the “fire upon the earth” (Luke 12:49) that Jesus intended all of his disciples to be. In our own day, we can see the same work of the Holy Spirit in the Neo-Catechumenal Way, the Christian Life Movement, Walking with Purpose, ENDOW, the Fellowship of Catholic University Students, and so many other new apostolic efforts. The new ecclesial movements are a very important moment of grace for the Church, including the Church in Philadelphia. We shouldn’t fear them because this is exactly how the Franciscans and other religious communities once began. We should welcome the zeal behind these new charisms wholeheartedly, even as we test them. The Church is always in need of change and reform, but change and reform that remain faithful to Jesus Christ and the soul of Catholic teaching. Real renewal is organic, not destructive. Let’s turn to the second word: Church. The Church is not a “what,” but a “who;” not an “it,” but a “she.” Nobody can love the Church as an institution any more than they can love General Motors or the IRS. The Church has institutional forms because she needs to work in the legal and material structures of the world. But the essence of the Church is mother and teacher; guide and comforter; family and community of faith. That’s how we need to think of her. And the Church is “his” Church, the bride of Jesus Christ, not “our” Church in any sense that we own her or have authority to rewrite her teachings. The great third-century bishop St. Cyprian once said, “You cannot have God for your Father if you do not have the Church for your mother.” We should belong to the Church as her sons and daughters. The Church should live in our hearts like our family does, and we should come together on Sunday to love and reinforce each other as a family, to praise our Father and to share the food he gives us in his Son. Our Sunday worship should be alive and full of faith and celebrated with conviction and joy. Bricks and mortar are a dead shell without a zeal for God and for the salvation of each other burning inside the parish walls. The third word is mission. Our mission, our purpose and task as Christian disciples, is simple: “Make disciples of all nations” (Matthew 28:19). Jesus meant exactly what he said, and he meant those words of the Gospel for all of us, including you and me. We need to bring Jesus Christ to the whole world and the whole world to Jesus Christ. Our mission flows straight from the inner life of the Trinity. God sent his Son. The Son sends his Church. And the Church sends us. Obviously, we can’t convert the world on our own. We’re not called to succeed. Success is God’s business. Our business is trying, working together and supporting each other as believers and always asking God’s help. God does listen. He’ll handle the rest. But we do need to try. We need to be more than just maintainers of old structures. We need to be missionaries. Fourth and finally, there’s that word faith. Faith is not an emotion. It’s not a set of doctrines or ideas, though all these things play an important part in the life of faith. Faith is confidence in things unseen based on the word of someone we know and love, in this case God. Faith is a gift of God. He chooses us. We can certainly ask for the gift of faith, and when it’s offered, we can freely choose to accept it or not. But the initiative is God’s, and only a living encounter and a living relationship with Jesus Christ make faith sustainable. Faith opens our eyes to God’s real reality. Because we see with new eyes, we have reason to hope. And hope enables charity by allowing us to put aside fear and to look beyond ourselves to the suffering and needs of other people. History is shaped and life is advanced by people who believe in something more important than themselves. So faith is the cornerstone of Christian life because it enlarges us; it animates us; it’s restless. It must be shared or it dies. It takes us outside ourselves and allows us to risk. Now let’s go back to the three points I mentioned at the start of this talk. The first point I want to talk about is where we are as a Church and as individual Catholics, given the current environment of our country. We need to know the facts of our pastoral terrain before we can renew or achieve anything. Some of you here today probably saw the movie from a few years ago called Cinderella Man. It’s based on a true story: the story of Jimmy Braddock, the Irish Catholic boxer who came from nowhere to win the 1935 world heavyweight championship. Out of work, injured and poor in the middle of the Great Depression, Braddock never betrays his wife. He never gives up on his duties as a father. He’s honest, humble, grateful, hardworking, faithful to his friends, and he pays back every dime he receives in unemployment assistance from the state. Most of all, Braddock accepts the pounding that life gives him, both in and out of the ring. He endures it without bitterness. He never quits. And, in the end, he does something almost miraculous: He wins the title from the great champion Max Baer. People who love this film love it for a reason, despite its violence: In many ways, the character of Jimmy Braddock embodies the very best of American virtue. The trouble is: Less and less of that virtue now seems to survive in American life, except as a form of nostalgia. And nostalgia is just another thread in the same cocoon of unreality that surrounds us 24 hours a day on our TVs, in our theaters, in our mass marketing and on the Web. In a sense, our political and economic power, our addictions to comfort, consumption and entertainment, have made us stupid. David McCullough, the Pulitzer Prize-winning writer, said recently that we’ve become “historically illiterate” as a nation. He told the story of a student at a prestigious university who attended one of his lectures and thanked him afterward. Until she heard him speak, she said, she had not known that all 13 of the original American colonies were located on the East Coast. The illiteracy goes beyond history and other academic subjects. Notre Dame social researcher Christian Smith and his colleagues have tracked in great detail the spiritual lives of today’s young adults and teenagers. The results are sobering. So are the implications. The real religion of vast numbers of American young people is a kind of fuzzy moral niceness, with a generic, undemanding God on duty to make us happy whenever we need him. It’s what Smith calls “moralistic therapeutic deism.” Or, to put it in the words of a young woman from Maryland, “It’s just whatever makes you feel good about you.” As Smith observes: “It’s not so much that Christianity in the United States is being secularized. Rather more subtly, either Christianity is [degenerating] into a pathetic version of itself or, more significantly, [it’s] actively being colonized and displaced” by a very different religious faith. This is the legacy — not the only part of it, but the saddest part of it — that my generation, the boomer generation, has left to the Church in the United States. More than 70 million Americans describe themselves as Catholics. But for all practical purposes, they’re no different from everybody else in their views, their appetites and their behaviors. This isn’t what the Second Vatican Council had in mind when it began its work 50 years ago. It’s not what Vatican II meant by reform. And left to itself, our life as a Church is not going to get better. It’s going to get worse. So if we want a real renewal of the Catholic faith in Philadelphia, in the United States and worldwide, it needs to begin with us, right here and right now. That leads me to my second point: what we need to do about the pastoral realities we face. In calling for a Year of Faith, Pope Benedict said that “the renewal of the Church is ... achieved through the witness offered by the lives of believers.” That means all of us — clergy, religious and lay. We all need repentance, and we all need conversion. The clergy abuse crisis of the past decade has been a terrible tragedy. It’s caused great suffering. It’s wounded many innocent victims. It’s turned thousands of good people away from the Church. As a bishop, I regret these things bitterly, and I apologize for them, especially to the victims, but also to our people and priests. God will hold all of us who are bishops to a hard accounting for the pain that has resulted. And I accept that as a right judgment. But if we’re honest — and there can be no real reform, no real renewal, without honesty — we need to admit that the problems in American Catholic life today are much wider and much deeper than any clergy scandal. And they’ve been growing in our own hearts for decades. If young people are morally and religiously ignorant by the millions, they didn’t get that way on their own. We taught them. They learned from our indifference, our complacency, our moral compromises, our self-absorption, our eagerness to succeed, our vanity, our greed, our lack of Catholic conviction and zeal. We made this moment together — clergy, religious and lay. And God will only help us unmake the failures of the past and remake them into a moment of renewal, if we choose now to serve God’s purposes together. If we really want new life in the archdiocese, some of what we need to do is obvious. We need to protect and educate our young people. We need to impress on their hearts that salvation is not just a pious fiction, but a matter of eternal consequence: a gift that cost God the life of his own Son. Our Catholic schools are vital in this work. St. John Neumann founded our schools 150 years ago to protect the faith of our young people from Protestant pressure in the classroom. But our same Catholic schools are even more important today in a time of aggressive secularism, moral confusion and bitter criticism of the Church. We need to do much more to support the priests, deacons and religious who minister so generously to our minority communities. Minorities bring a huge transfusion of new life into the Church. We also need to help our minority communities see that they too share God’s call to be missionaries. We need to use our material resources far more wisely, and then we need to be accountable for them. We need to be eager again to invite young men to the priesthood, starting with parents who encourage their sons in the home. Nothing is more heroic as a way of life than a priesthood lived with purity and zeal. And we need to form our young priests to be more than just maintainers and managers, but real missionaries: new men for a new kind of mission field, with a hunger to bring the whole world to Jesus Christ. Finally, we need to build a new spirit of equality, candor and friendship that weaves together every vocation in our Church. Priesthood, the diaconate, religious life and the lay vocation: Each has a distinct and irreplaceable importance. There are no “second class” Catholics and no “second class” vocations. We need each other. In a way, being together today in mid-November to talk about the future of the Church is exactly the right time for our theme. November is the month of All Saints and All Souls [Days]. It’s a time when the Church invites us to reflect on our own mortality and the universal call to holiness we all share. Life is short. Time is the one resource we can never replenish. Therefore, time matters. So does what we do with it. In the end, renewal in the Church is the work of God. But he works through us. The privilege and the challenge belong to us, so we need to ask ourselves: What do I want my life to mean? If I claim to be a Catholic, can I prove it with the patterns of my life? When do I pray? How often do I seek out the sacrament of penance? What am I doing for the poor? How am I serving the needy? Do I really know Jesus Christ? Who am I leading to the Church? How many young people have I asked to consider a vocation? How much time do I spend sharing about God with my spouse, my children and my friends? How well and how often do I listen for God’s will in my own life? The Church has many good reasons why people should believe in God, believe in Jesus Christ and believe in the beauty and urgency of her own mission. But she has only one irrefutable argument for the truth of what she teaches: the personal example of her saints. And that brings me to my third and final point: who we need to be and who we need to become. A Man for All Seasons won Oscars for both "Best Picture" and "Best Actor," and it’s clearly one of the great stories ever brought to the screen. But it captures only a small fraction of the real man. In his daily life, Thomas More loved to laugh. He enjoyed life and every one of its gifts. Erasmus, the great Dutch humanist scholar and a friend of More and his family, described More as a man of “amiable joyousness [and] simple dress ... born and framed for friendship ... easy of access to all,” uninterested in ceremony and riches, humble, indifferent to food, unimpressed by opinions of the crowd and never departing from common sense. Despite the integrity of More’s character, and despite his faithful service, Henry VIII martyred him in 1535. More refused to accept the Tudor king’s illicit marriage to Anne Boleyn, and he refused to repudiate his fidelity to the Holy See. In 1935, the Church declared Thomas More a saint. Today — half a millennium after he died and a continent away — this one man’s faith still moves us. That’s the power of sainthood; that’s the power of holiness. The only thing that matters is to be a saint. That’s what we need to be. That’s what we need to become. And if we can serve God through the witness of our lives by kindling that fire of holiness again in the heart of Philadelphia, then God will make all things new: in our Church, in our families and in our nation. 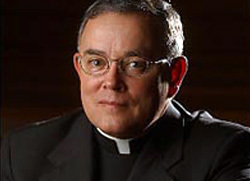 Archbishop Charles Chaput, OFM Cap., is the archbishop of Philadelphia.